Bordering Billericay and the picturesque village of Stock. The bungalow is situated in a semi rural location, set back from one of Billericays most prestigious roads. The property stands on a five acre plot accessed down a long gravel drive, with adjoining fields and a well stocked fishing lake affording privacy, peace, tranquility and a lovely view. 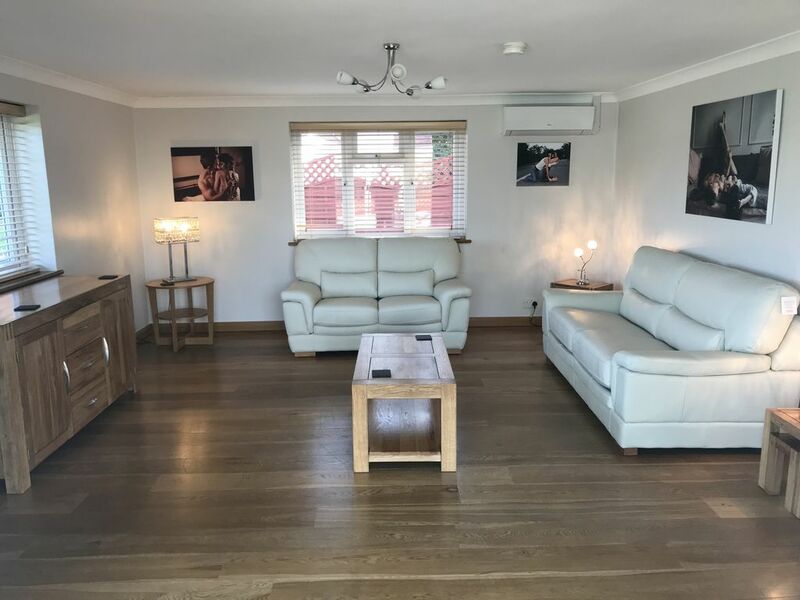 The bungalow incorporates a fully fitted kitchen diner, full bathroom with separate shower unit and double ended bath, large double bedroom, large lounge and conservatory. With modern solid oak furnishings in the bedroom and lounge and wicker furniture in the conservatory standing on a solid oak floor. The kitchen, hall and bathroom stand on a polished black slate floor. The bungalow has ample parking and its own garden. Guests are also welcome to walk on the adjoining fields and fish the well stocked carp lake at no extra charge. A small row boat is available if you dare. I work from home on the farm so there is a small amount of coming and going but the privacy afforded to the bungalow is not affected as the bungalow lays behind its own hard wood gates, hedgerows and has a separate entrance to the main residence. The Stock Brook Country Club with its 27 hole championship golf course is within walking distance and Crondon Park Golf and Country Club is only a few minutes drive. Both venues also have established reputations as being premier wedding venues in Essex. Billericay train station provides direct services into London Liverpool Street Station with excellent connections onto the underground network, making day trips to London a must. Michelle and I in the main house on the same site as the bungalow. We also run a business from home so I am about all day if needed. We lead a busy social life and enjoy meeting new people and experiencing new things. We have traveled extensively and enjoy the quiet life when at home. We are very easy going and pretty much anything goes. Private fresh water carp lake on site available for the guests to fish exclusively should they wish. We were exceptionally impressed with this beautiful bungalow and the host Andy. The top quality furnishings, linen, and kitchen ware gives a luxurious touch whilst being very comfortable. We stayed in December and the Christmas Tree was a lovely touch. The bathroom has a large bath and a powerful shower. Kitchen is well equipped and includes a washing machine and separate dryer. There is a super king size bed with a lovely mattress. Also amble hangers in the 2 wardrobes. The property was warm and cosy throughout. We did note that there is air conditioning for the Summer nights. The outlook from the property is over green fields with a view of the lake in the distance. There is a large conservatory which provides additional space and light. The property is accessed by security gates so feels a really safe place to stay. There is amble parking as well. The property is next to the owners so if there is any issues they are on-site to assist. In summary, a beautifully presented, secure property in a lovely rural setting but close to shops and amenities. Highly recommended - we will be back!